This article appeared in the Doctor Q magazine in summer 2017. 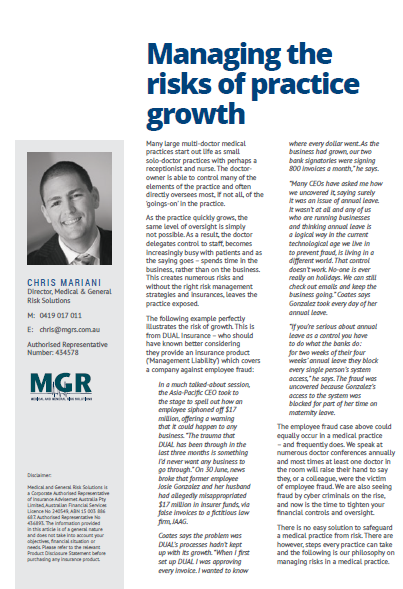 A timely reminder for all practices owners on the importance of risk management measures, particularly as they grow and start to hand over key business functions to staff. Many large multi-doctor medical practices start out life as small solo-doctor practices with perhaps a receptionist and nurse. The doctor-owner is able to control many of the elements of the practice and often directly oversees most, if not all, of the ‘goings-on’ in the practice. As the practice quickly grows, the same level of oversight is simply not possible. As a result, the doctor delegates control to staff, becomes increasingly busy with patients and as the saying goes – spends time in the business, rather than on the business. This creates numerous risks and without the right risk management strategies and insurances, leaves the practice exposed.